This area was a hot bed of activity during the War of 1812 which celebrates its 200th anniversary next year. 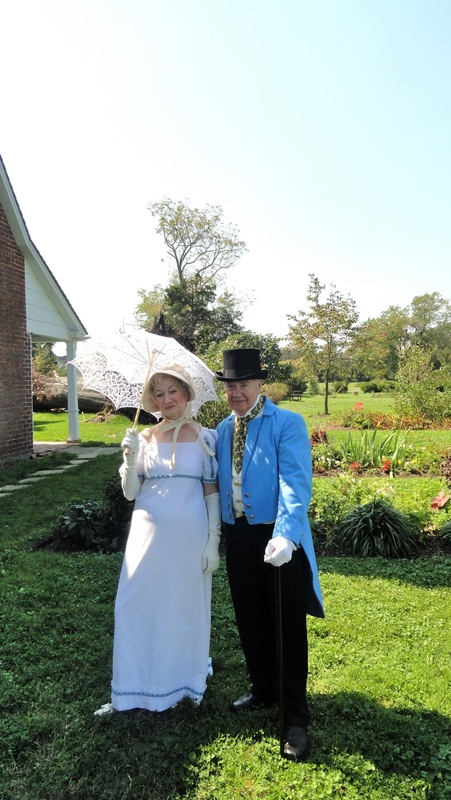 Re-enactors bring the 1700s to life at historic Old St. Mary's. Before that, there was Historic Old St. Mary's, the fourth permanent English settlement in the New World and Maryland's first capital, thanks to Lord Baltimore. Today it's a 17th century living history museum in a la Williamsburg and a delight to visit. Tip: You will encounter stairs here, especially if you want to go down to the dock. Walking, too, but it's no real challenge. Before Monticello or Mount Vernon, there was Sotterley Plantation on the banks of the Pawtuxent River, the only remaining Tidewater Plantation in Maryland open to the public. A National Historic Landmark, too. You might find re-enactors at Sotterley, too. 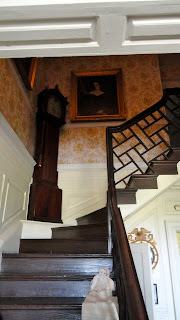 Tip: You'll do some walking here and encounter stairs if the upper floor of the plantation is open. Summerseat is where the buffalo roam. The current Summerseat residence was built in 1884. Another historic spot is Summerseat Farm in northern St. Marys County. Known by that name since 1678, the current Queen Anne-style house was built in 1884. Today it is a working farm where buffalo are bred and where visitors with reservations are welcome to have a look, visit the out buildings and petting zoo. 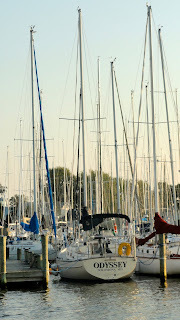 A gracious stretch of along Chesapeake Bay. 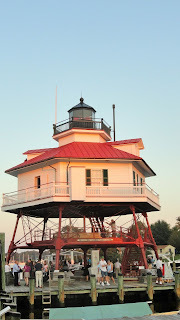 When you've had it with pounding pavement, standing on marble and climbing stairs in our nation's capital, Maryland's Western shore of Chesapeake Bay makes a great respite, a place to kick back, wade in water, indulge yourself and just relax. Chesapeake Beach Resort & Spa is a good spot to headquarter. There are many good places to stay but I was taken with the centrally located Chesapeake Beach Resort & Spa. Great views off your comfortable room's balcony, good food, pleasant service with fishing and boating a few steps away. There's a large indoor pool and an outdoor amphitheater for concerts too. Right next door there's also the small but interesting Chesapeake Beach Railway Museum, documenting the area's heyday when a train brought thousands from the hot cities of Baltimore and Washington, D. C. to the cool waterfront of Chesapeake Beach. Food is a big part of the Chesapeake Bay story, from crab pots and oyster farms to fine French cuisine and Amish shoe fly pies. Foodies will revel in the well-entrenched slow cooking, locally accessed, sustainable products and organic farming movements. 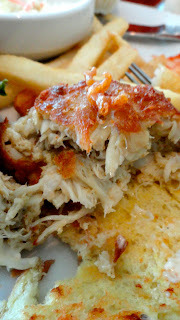 Rod 'N' Reel's excellent Crab Cake Sandwich. You won't go wrong with Ruddy Duck's crab cake. You can survey Maryland crab cakes to find the best. My search over a brief three-day period turned up divine to inedible and everyone I talked to had a favorite place I didn't have time to try. Of the few I was able to try, Rod 'N' Reel and Ruddy Duck Brewery and Grill in Solomons served up my faves. 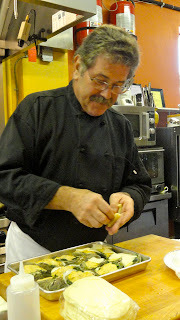 Chef Jafres gives a demonstration. Chef Loic Jaffres whips up divine French fare and serves some very drinkable Maryland wines at Cafe des Artistes in Leonardtown. 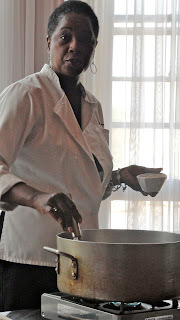 Chef Obal shows how to stir up a good low country roux. Chef Charleen Obal serves good low country fare at Saphron Restaurant in Prince Frederick. Amish shoe fly pie varies from cook to cook. About 300 Amish and Mennonite families live in St. Mary's County where back roads come with wide shoulders for their horse and buggies. 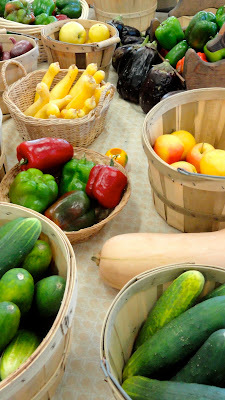 To find their unique fare and products, try Zimmerman's Greenhouse and Produce in Leonardtown for Mennonite-crafted work; Loveville Produce Auction in Loveville; Farmers Market & Auction and North St. Mary's County Farmers Market in Charlotte Hall for Amish goods. Northbeach on the Western shores of Chesapeake Bay. Chesapeake Bay is more than crab cakes, especially its Western shore. Long thought of as a bedroom community for Washington, D.C., the Western shore is packed with interesting places to go and things to do. Boats, boats, everywhere you look. If you like the water and boating you'll love it here. Fingers of land jut into the bay making perfect, protected anchorages that bristle with masts and powerboat bridges. At good place to start is Calvert Marine Museum in Solomons. 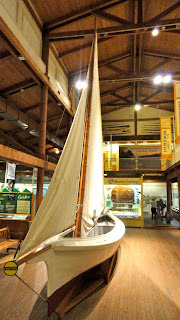 The museum covers all facets of area boating from boat building, commercial fishing, racing and pleasure. In the dock area you'll find historic craft of all kinds on display as well as the working headquarters for the Pawtuxent Small Craft Guild. Nearby is a classic woodworking shop. 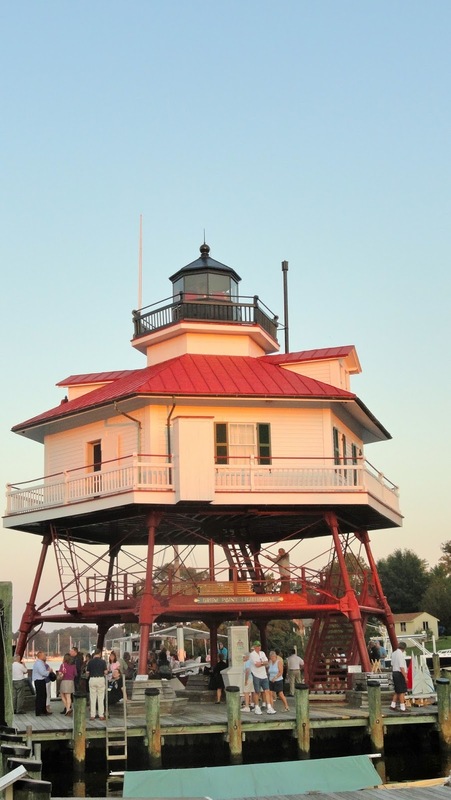 Also fascinating is the 1883 hexagonal Drum Point Lighthouse that dominates the adjacent docks. Pawtuxent River Cruises offers our-long cruises aboard the historic 189 buyboat Wm. B. Tennison docked at the marina there. Fishing more your thing? I went out on Mary Lou Too, a 46-foot charter fishing boat, with its personable captain Russ Mogel. 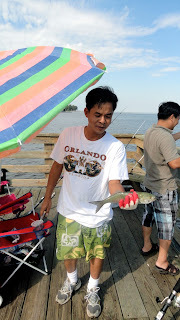 Striped bass (stripers, rockfish) are top springtime catches; black drum, spot, croakers, sea trout, Spanish mackerel, white perch and bluefish are prevalent the rest of the year. 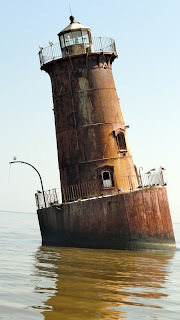 Ours was not a fishing expedition so we headed for the Sharp's Island Light, the famous leaning lighthouse. An ice storm caused its Tower of Pisa stance and although it still works, the structure looks more like a tipsy, rusty derelict that has become an old seagulls' home. As we approached the docks, we saw an eagle devouring its catch on the jetties. 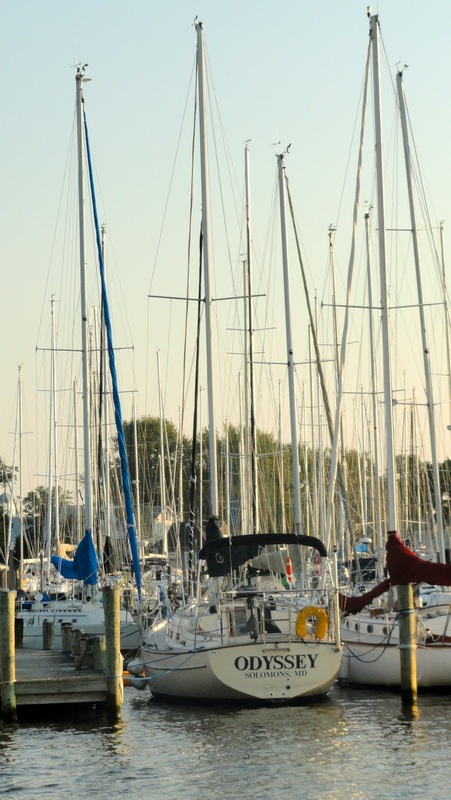 You can find charter boats all over the area as well as fishing piers like the one at North Beach. 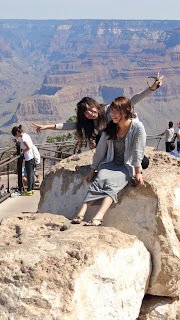 What to do at the Grand Canyon? There are tours, easy or challenging mule rides and great shopping for Native American crafts and jewelry at reasonable prices. This is Travel on the Level so I assume you aren't interested in hikes. If you are, the Park Service can recommend several within your skill level. First, though, you need to look into and at the canyon. Geologists can take hours explaining how it occurred, park rangers do it in less time, but the most succinct version is my favorite: "The land came up, the river went down and the walls fell in." And boy, what a sight they created. You can go from the East to the West rims by way of the South rim in the National Park Service's free, hop on, hop off shuttle buses. Your time will be well spent taking the shuttles around and hopping off at each overlook because each one gives you a different perspective on the canyon. Photographers love the sunrise and sunset tours and almost anyone will gain a better appreciation of what they are seeing because the people behind the wheels are combination geologists, historians, story tellers and drivers. Tip for those who go on a sunrise or sunset tour: 95 percent of amateur photographers aim for that rising or setting ball of fire and wind up with blown out backgrounds. Far better are photographs taken shooting away from the sun. You'll not only see the effects of that orb's action, the canyon will be captured at its most dramatic. Here are my recommendations for what to see and do. It's everyone's first stop because there's more here. 1. Stroll through El Tovar's lobby. Buy a beverage at the bar, take it out on a porch, grab a rocking chair and watch the panoply of spectacular landscape and a world's worth of people. 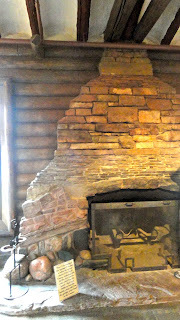 Geological fireplace designed by Mary Colter in the History Room. 2. History Room in Bright Angel Lodge gives a fascinating look at how everything around you came to be. Of particular interest is the story of Mary Colter, the Santa Fe Railroad's architect whose study of Native American tribes indigenous to the area and creative handling of local materials created such wonderful buildings. Her fireplaces are works of art too, each different and each special. View from a Lookout Studio,"patio". 3. Lookout Studio is another Mary Colter gem with multi-level patios from which you can look for riders and hikers along Bright Angel Trail or try to spot condors riding thermals overhead. On the way you'll pass the Buckey O'Neil cabin, longest-standing structure at the canyon built by a stalwart character if ever there was one. Ranger program in Kolb Studio. 4. Kolb Studio, multi-storied home of multi-talented brothers Ellsworth and Emery who became famous for their photographs and explorations of the canyon and the Colorado River. Fans of Southwest Native American skills will love Hopi House. 5. Hopi House, Colter's first major project in the canyon, houses a fine collection of genuine Native American handiwork, particularly on the second floor. In the early days it was home to working Hopi craftsmen and women. 6. Mule rides. Sure-footed, strong and patient, mules have been carrying visitors into and around the canyon since the early 20th century. The ride through a ponderosa pine forest to the Abyss overlook is the best for beginners, the trip down the canyon along Bright Angel Trail is best for the more daring. Colter fireplace at Hermits Rest. 1. 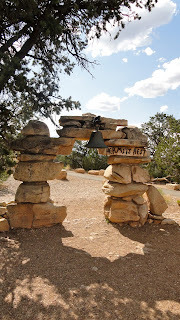 Hermits Rest was designed as a way station by Mary Colter and built in response to tolls being charged by Ralph Cameron to visitors wanting to reach the canyon's bottom via his Bright Angel Trail. This and the trail below became an alternative; now it's a great overlook with another of Colter's wonderful fireplaces. 2. Hermit Road goes from Powell Point to Hermits Rest past some pretty spectacular overlooks, namely Hopi, Mohave and Pima Points. The Watchtower at Desert View. 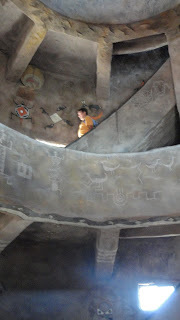 Spiral staircase and Pueblan symbols enliven the inside of the tower. 1. Whatever you do, do not miss Desert View and the Watchtower, one of Colter's most amazing works. 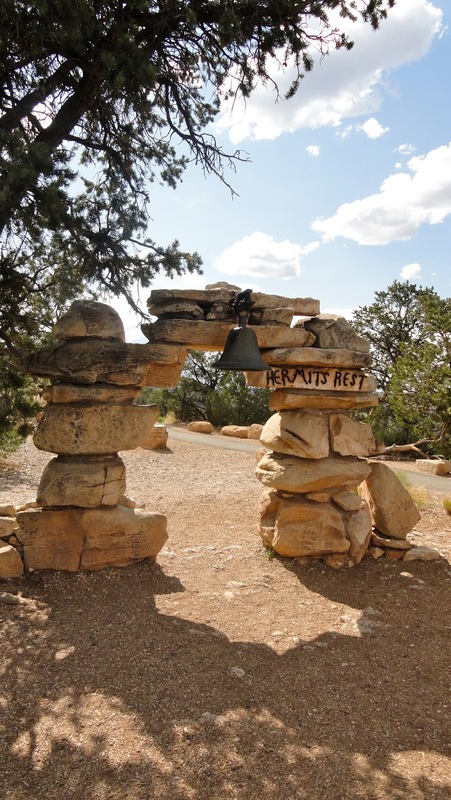 Developed as the Eastern gateway to the canyon, the 70-foot high, steel-framed Watchtower is modeled after prehistoric towers erected by much earlier residents. 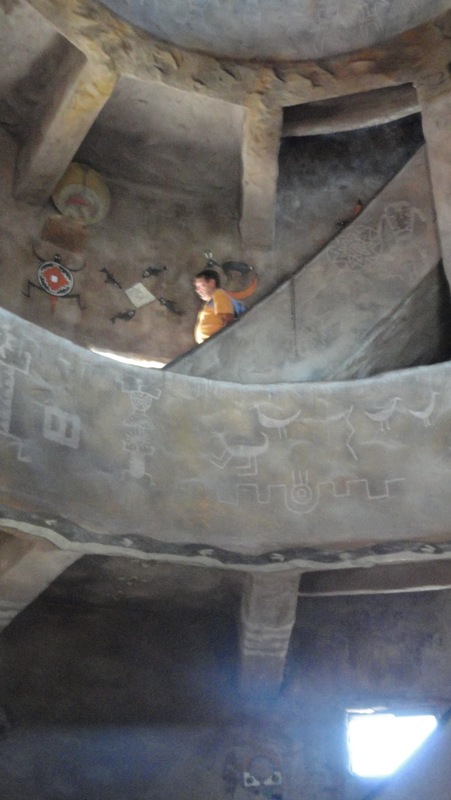 The interior, fashioned by Colter, Fred Geary and Hopi artist Fred Kabotie, spirals up several levels and is adorned with depictions of prehistoric Pueblan symbols and legends. Warning: The 85 steps are narrow and difficult. I made it up to the second level - 21 steps - and called it quits. Levita and Elan were visiting from Taipei, Taiwan. 2. 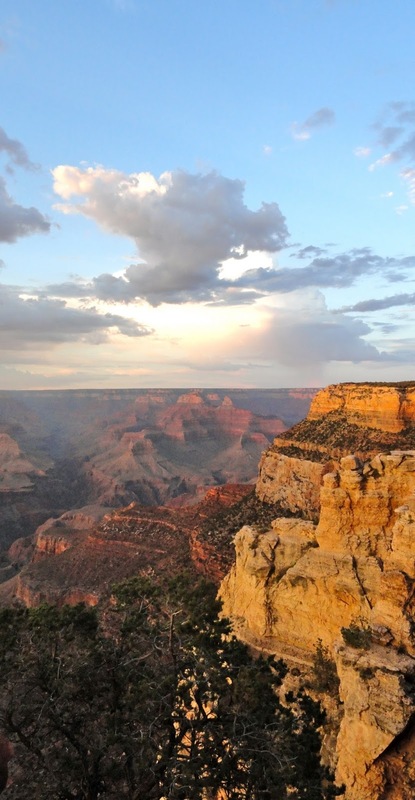 It's easy to see why Mather Point is so popular. It's a photographer's dream. There is a two-rock formation that everyone has pictures on - standing, sitting, jumping. It's irresistible to posers and lookers alike. 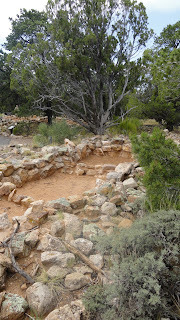 Excavation began at the Tusayan ruins in 1930. 3. 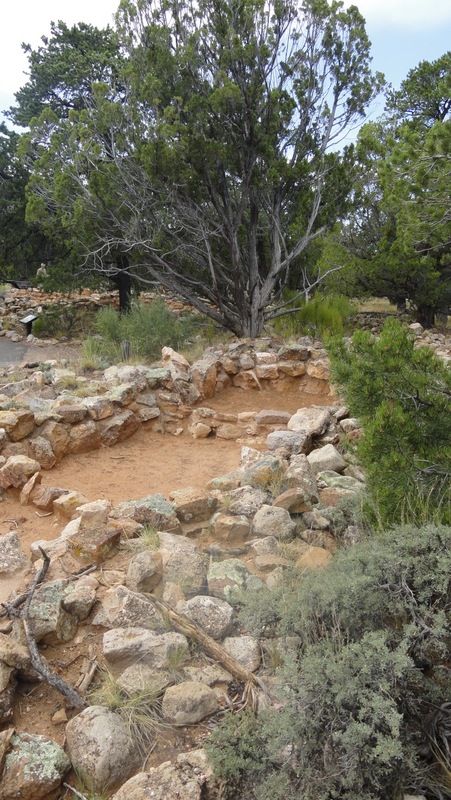 Tusayan Ruin is an archaeological work in progress with a small, interesting museum of what's been found, leftover from the tribes who lived here 1185-1210. Most visitors overlook it, but I found it worth a stop. Desert View Drive is full of wonderful overlooks. 4. 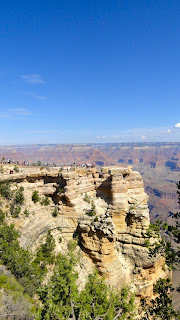 Other points along this end of the rim worth stopping at include Yaki, Grandview, Moran and Lipan Points. You're here; stop and look. 5. 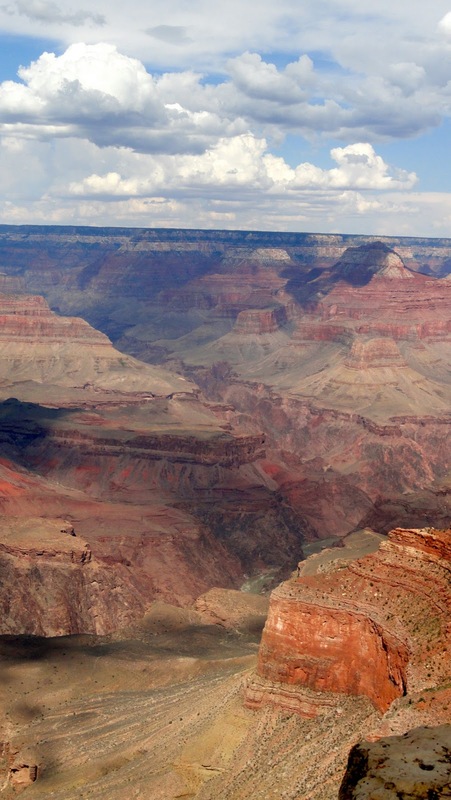 Grand Canyon Visitor Center is a ho-hum after you've seen the canyon. There is a good film but other than a pick-up point for all three shuttle bus routes and lots of parking, that's about all. Again, you're here so go ahead and stop if you have time. Cute but its teeth are sharp. 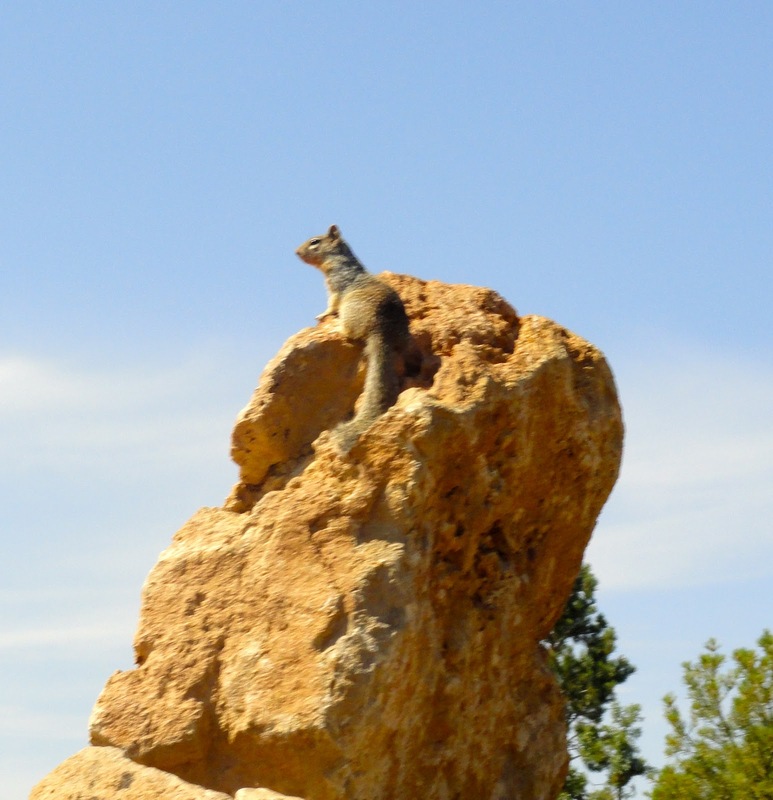 Warning: Wherever you go in the canyon, don't feed or try to touch the wildlife, especially the squirrels, those cute, bold beggars. Rodent bites are the injuries most treated at the clinic.